Aermacchi, Benelli, BMW, BSA, Ducati, Enfield, Honda, Jawa, Kawasaki, Moto Guzzi, Moto Laverda, MV Augusta, MZ, Norton, Suzuki, Triumph and Yamaha. For more information about electronic ignition systems and replacement ignition kits for your motorcycle - click the following links or scroll down the page. Fuel economy - by burning the petrol more completely the engine uses less fuel resulting in a significant increase in miles per gallon. Increased power - as a direct result of more complete combustion, the engine produces more power for the same amount of fuel making your car or bike more responsive. Better starting - the increased energy in the spark makes starting easier and gives "first time" starting almost every time. Reliability - the unit gives a reliability, which is only obtainable through the latest solid state electronics. Cleaner exhaust and lower greenhouse gas emissions - electronic ignition is the standard in many countries that have stringent exhaust regulations. Reduced maintenance - with no contacting moving parts to wear out, no points to replace, and timing that stays accurate for an indefinite period maintenance requirements are considerably reduced. Smoother running - the accurate timing of the unit together with the complete elimination of points bounce means that an engine runs much more smoothly. The contactless electronic ignition system uses an optical trigger to energize the coil. A slotted disc fitted, revolves between an infra-red light emitting diode and a photo-transistor. As the slots in the disc alternately expose and cover the light they activate the photo-transistor which in turn triggers the circuitry to switch the coil and produce a spark. At high speeds, the disc system allows up to three times longer for the coil to charge than is available with a points system. This ensures a powerful spark even at high speed. Another important feature of this system is that there are no contacting moving parts, so wear and tear are eliminated and the timing stays accurate for an indefinitely long period. The NewTronic ignition kit is easy to fit and comes with full, simple fitting instructions. First the old points and condenser are removed from the distributor and replaced by the adapter, disc and lamp. All that remains is to connect the unit to the coil, a 12 volt power supply and to earth. (Click to view diagram.) 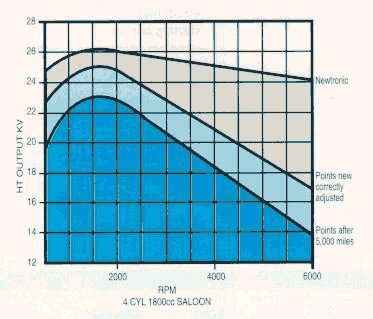 The diagram clearly shows the advantage that can be gained from fitting a NewTronic Contactless Ignition system. The grey area shows just how much more energy the spark has even over correctly adjusted new points. The light blue areas shows how spark energy decreases as points become worn. After 5,000 miles the frictional wear and points erosion will impair the timing and reduce the energy available to the spark. Contactless Ignition has no frictional losses and is switched faster at all speeds for ultimate efficiency. Rotor(s): In some kits there are several rotors supplied to increase the number of motorcycles that the kit will fit. Switching Unit: This will be a single, twin, or triple channel switching unit depending on the motorcycle make and model. If you don't see your make and model listed, Contact us with your requirements and let us know what you are looking for. A switching unit (black box) and adaptor kit is available separately if required - see Order Form.